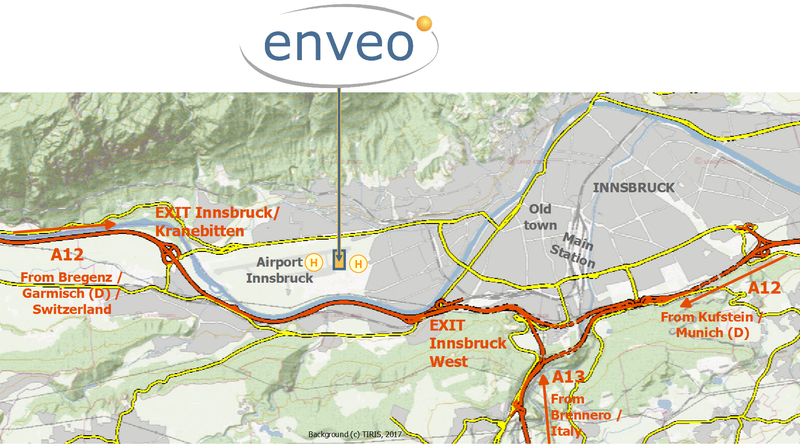 The new office of ENVEO is located next to the airport, in the west of Innsbruck. It is easily accessible by car and public transport. Exit the motorway A12 at Innsbruck West or optionally Innsbruck Kranebitten. Follow the signs towards the airport (Flughafen) of Innsbruck. Just a few meters before the airport, on the right hand side, the ENVEO office is located in the first floor of the black building with the inscription "Tyrolean". ENVEO is located in the west of Innsbruck.Coming from city centre, take the direction towards Innsbruck / Flughafen, and follow the signs to the airport (Flughafen). Just a few meters before the airport, on the right hand side, the ENVEO office is located in the first floor of the black building with the inscription "Tyrolean". Take the bus line F (direction to Flughafen) and get off at the halt Uni-Sportstätten or optionally at the last halt Flughafen. In each case, walk 3 minutes to the black building with the inscription "Tyrolean", where ENVEO is located. Us the IVB Bus Journey Planer for getting the actual time table of busses. Exit the airport building and turn to the left, and walk 250 m until you reach a black building with the inscription "Tyrolean". The office of ENVEO is located in the first floor of the building.